The second thing that was left undone on the Island of Crete was the appointing of Leaders in the local churches. Without the right leadership nations as well as churches will fall. Paul understood this important truth and commanded Titus to find the right leaders and get them official installed as such before the congregation. He called these leaders “elders.” If we study the whole New Testament, however, we find that the Greek terms for pastor, elder and bishop are used interchangeably. Further study reveals that each church was to have more than one of them. They are always referred to in the plural. The point I want to focus on however is that what was left undone in the churches in Crete was the solid establishment of leadership. The selection of leaders was to be done on the basis of character traits of the individuals, not on their social position, education or financial status. Leaders were to be those who personified the character traits mentioned in the following chapters of this letter. Paul tells us that we’re at war with evil and we need the accoutrements for battle. Leaders must be strong and Courageous to set the example. Moses called Joshua to be strong and courageous as an example for the people. Joshua called the nation to be strong and courageous as they entered the battle. When Joshua died the following generation had not leadership! The nation fell into chaos. This chaos was upsetting the churches in Crete. What was described in the book of Judges before official leadership was established for the nation was “chaos” in the land, i.e., “everyone did that which was right in his own sight.” Leadership is absolutely essential to good order. 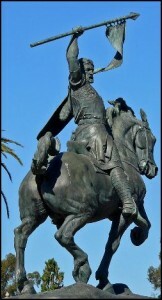 The film El Cid illustrates this concept. Charlton Heston in the title role was leading a Spanish army in a series of battles against the invading Moors, and just before the climactic confrontation, he was mortally wounded. His presence on the battlefield, however, was so important to the morale of his army that the few people who knew how badly he was hurt fastened him in his saddle and propped him upright so he could lead his troops into the fray. Seeing their leader before them, the Spanish soldiers took heart and fought on to victory. If El Cid had not been there, or if he had slumped in the saddle, his army might have lost heart and gone down to defeat. The Church needs godly leaders as examples to follow.